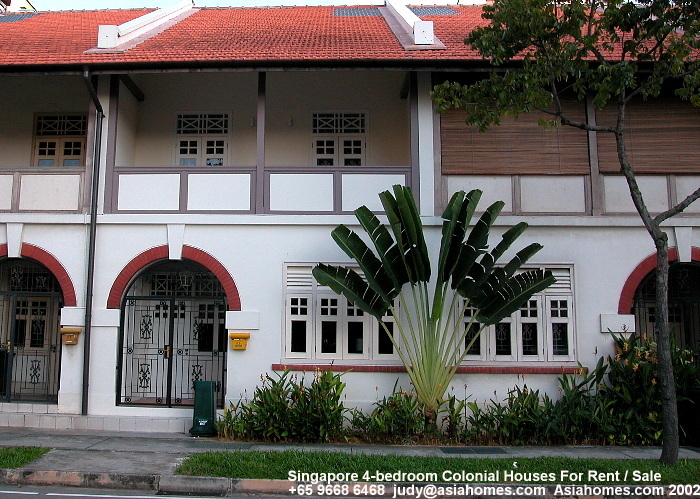 North East Singapore. Near new Japanese School, Loyang Industrial Park and Singapore Exposition. a. One 500sqm Swimming Pool and one 50sqm Wading pool. d. One Clubhouse with Sauna. a. Kitchen wooden cabinets with laminated surface. b. Water heaters to all bathrooms and kitchens, except WC. c. Split air-conditioning to all bedrooms, living/dining and family. d. Appliances - Cooker hob and hood to Kitchens. e. Security video intercom to all apartment units. a) Fibrous gypsum board to kitchen, bathroom and WC. b) Skim coat to other rooms. others. (No tiles behind kitchen cabinets and mirrors). External Wall Finishes Plaster to walls. for management office, gymnasium and games rooms in clubhouse). a. Timber decorative solid door to main entrance. Timber flush door to all Bedrooms, Bathrooms, Kitchen, Utility; PVC Folding Door to Store and WC. 1 long-bath, 1 vanity basin, 1 water closet, 1 towel rail, 1 soap holder and 1 toilet-roll holder. 1 wash basin, 1 water closet, 1 tower rail, 1 soap holder and 1 toilet-roll holder. 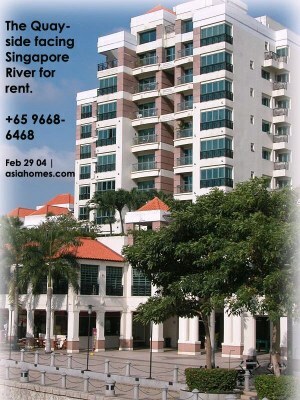 call Asia USA Realty 9668 6468, 6254 2728 for viewing. "The vet did not know how to treat my rabbits' skin disease." "The vet did not know how to treat my rabbits' skin disease," the pet shop owner complained to me. "After the vet had injected the rabbit, the skin disease still persist. I want to put these 3 rabbits to sleep." This was his first visit and it was to euthanase 3 grown up rabbits with crusty skin all over the ear edges, face and paws. Nobody would buy them now that they had grown up and looked diseased. They were not marketable. Also, they created a bad image of his pet shop. Veterinary costs would only add to the expenses. Singaporeans seldom buy grown up rabbits. "The rabbits suffer from Sarcoptic Mange and they can be cured within 2 weeks," I said. The pet shop owner was not convinced that he should throw away good money. What would he do even if the big rabbits were cured? There was no demand for rabbits as food in Singapore and well, the thought of eating rabbits was, simply, unthinkable. "It is not the veterinarian's lack of competence," I said. "Your rabbits would have been re-infested by mites in the environment and cages." His eyeballs rolled upwards to the sky. A veterinarian defending another or covering up incompetence, he must be thinking. He was wise not to comment or curse the veterinary profession. Pet shop owners and breeders are not favoured customers of many veterinarians as they want "cheap and good" treatments and phoned up for free consultations. So, I left matters alone. 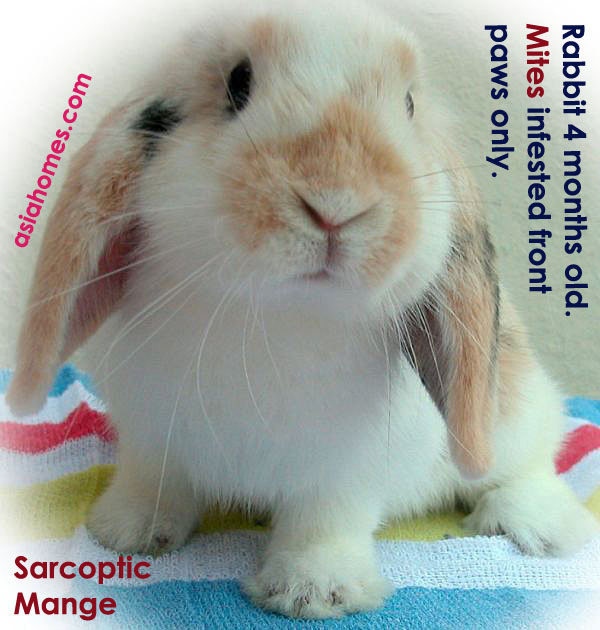 All Singapore veterinarians in practice know how to treat Sarcoptic Mange in the rabbit. This is the commonest rabbit skin disease seen in practice. On the second visit, the pet shop owner brought in another 3 rabbits with the crusty skin on the ear edges, nose and paws. "The disease is curable provided you have hygienic practices like isolation of the infested rabbits from others, asking your employee to use disposable gloves to handle the diseased rabbits and disinfecting the cage floor and the environment," I said, to pre-empt him from euthanasia. The rabbits had grown up as he had delayed seeking veterinary advice. He must have complied with the instructions as he came in the third time with a 4-month-old rabbit with very early signs of Sarcoptic Mange mite infesting its front paws only. "The 3 rabbits had recovered," he said. That was good news. He is aware of this condition and this 4-month-old rabbit should recover faster and be marketable. "How did it get infested?" I was puzzled. It was housed in the same area as the 2nd batch of infested rabbits. The floors of the area must have some mites and these mites had gone into the front paws. Slight patches of hair loss on the front paws. Redness of the skin of the toes. Quite obvious if you really scrutinise the rabbit. Time is needed to educate the pet shop owner about the Sarcoptic Mange in the rabbit. Time is what the veterinary surgeon seldom has if he has over 40 consultations a day. Yet, without education, pet shop owners tend to perpetuate the infestations and lose money on a curable and preventable Sarcoptic Mange in the rabbit. What happened to the first batch of 3 rabbits? They were cured by one anti-mite injection. It took me two months to find a girl who loved rabbits and gave them to her, free of charge. See: Can the father use money to buy happiness?